Kids, if there is one commercial holiday I love more than Valentine’s Day, it’s Halloween … you know what a HUGE horror movie fanatic I am, so it should come as no surprise that I love to dress up like a bloody murder victim, spectre, bride of the undead etc. on 31 October. As a teen, I used to have eight hour horror movie marathons, gorging myself on the gruesome delights of all of the classics: Halloween (all 25 of them! ), Scream, Nightmare on Elm Street, Friday the 13th, Rosemary’s Baby, Child’s Play, The Exorcist, Scream, The Ring and The Grudge … you name it, I screamed for it in ghastly glee. Nu Metro, the cinema giant was hosting a special anniversary edition of the Michael Keaton classic for Halloween and was giving away free tickets. I quickly gathered a group of friends, including your godfather Leon, to join me at the screening. 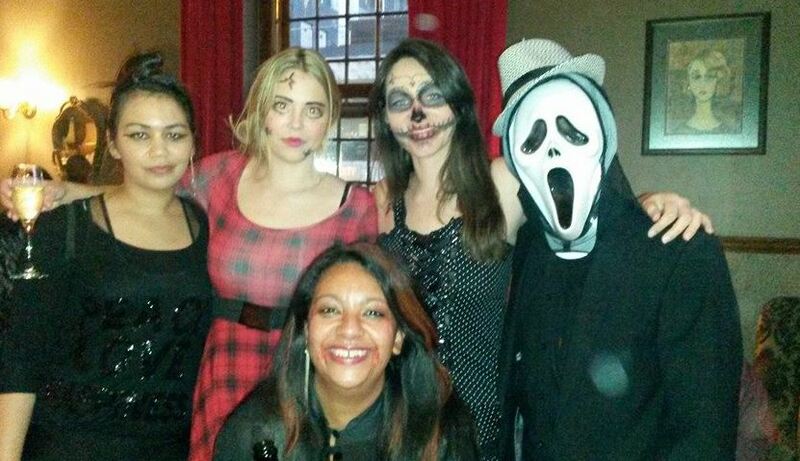 Of course, because we’re that fabulous, Leon and I were not going to let an opportunity to FINALLY dress up for the scariest night of the year pass us by so we rocked our freakiest zombie look, complete with demon eyes and classic make-up applied by your aunt Cynthia. 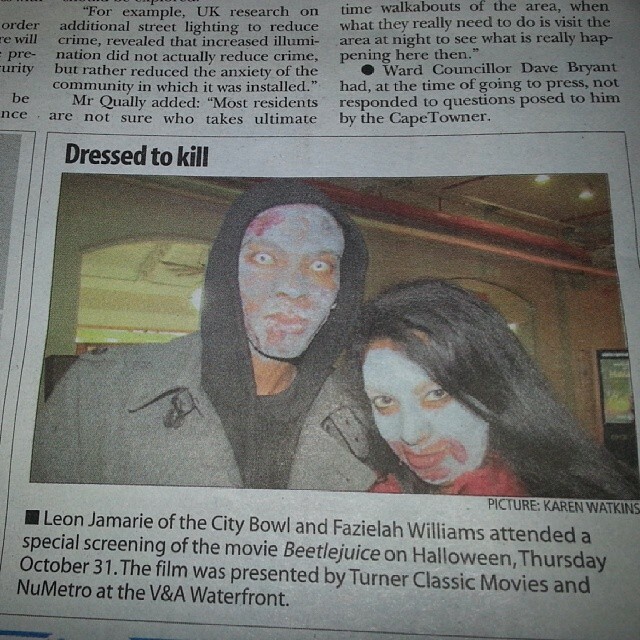 We relished walking the halls of the V&A Waterfront, scaring people to death and ,always ones to enjoy a photo op when it’s presented, we posed for The CapeTowner, who were attending the movie too… frightful fame at long last! Not content to just celebrate only one night of the month any longer, I had three different Halloween celebrations that October. 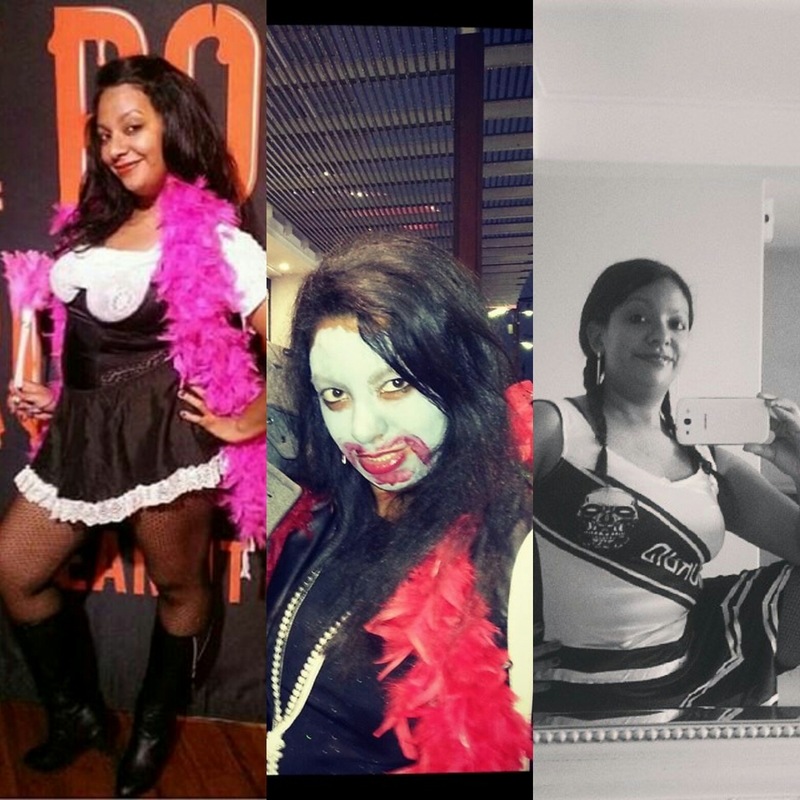 The first was my fourth viewing of the Rocky Horror Show musical at the Fugard Theatre with your Nan, aunts, godmothers and a few of our friends. 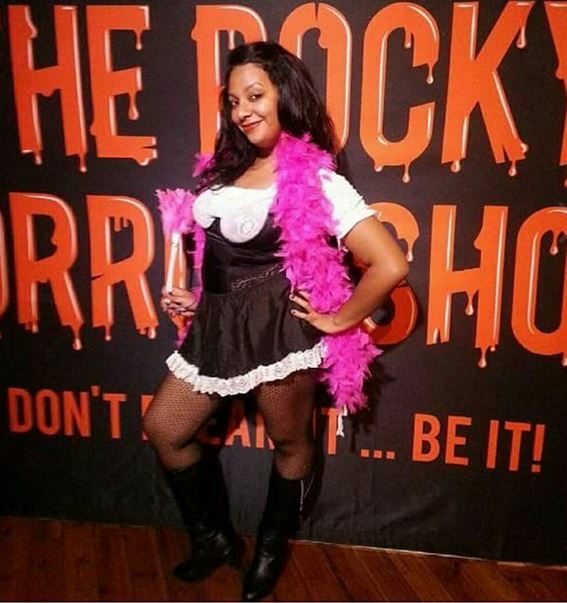 Naughty maids’ costumes, a plethora of feather boas, fishnet stockings and a flurry of hot pics with the insatiable Dr Frank-n-Furter was, of course, a must for the night. 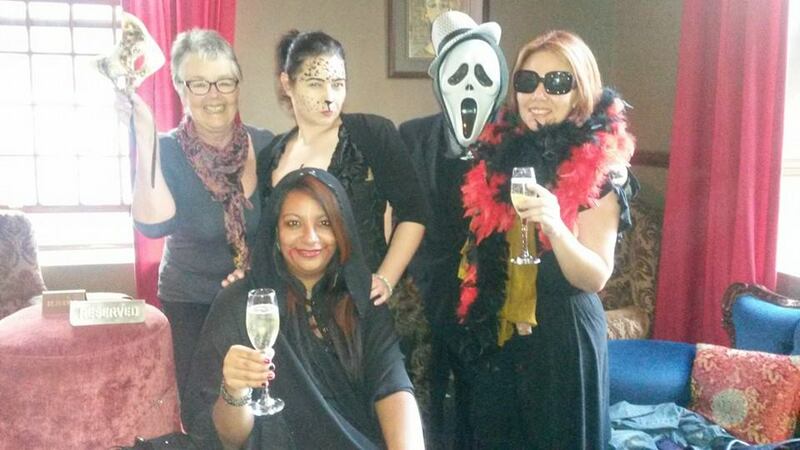 I’d resigned from my position as Cape Town’s socialite and needed to end it on a bang so how better than to host a Halloween-themed farewell party at my home from home, Alexander Bar and Café? Since I was still incredibly in-love with Alexander Skarsgard after our little “run-in”, my costume of choice for this very special party was, naturally, vampire bride …hee hee! The best part of it all was having my friends dress up too. From your aunt Leilah’s gorgeous black wings to uncle T’s hilarious Scream impersonation and Mr and Mrs Smurfette’s killer Bill and Sookie look, it was a murderous shindig of note. Of course, Lady K had to take things to the next level by offering us some very, very strong makes-you-forget-your-name absinthe! I might or might not have gotten really flirtatious with the bar manager after having that shot- which may explain why he was always all smiles whenever I went back to the bar after…eeecck! 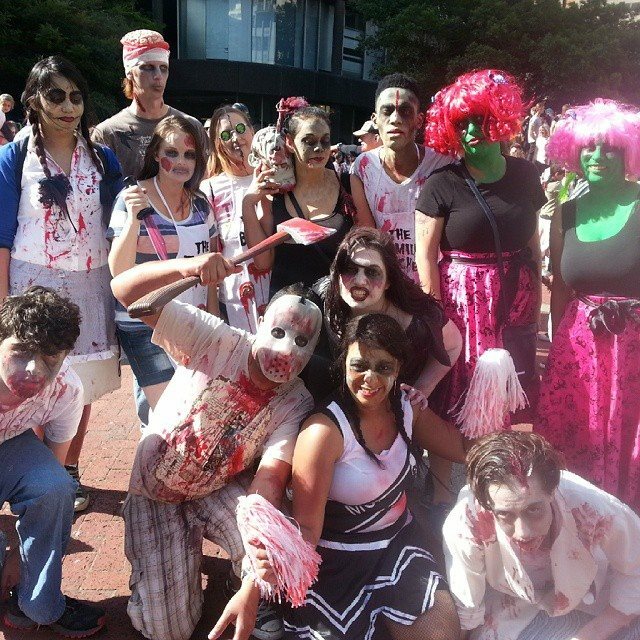 Day two of my Halloween weekend in 2014 and of course, the event of the day had to be Zombie Walk Cape Town. 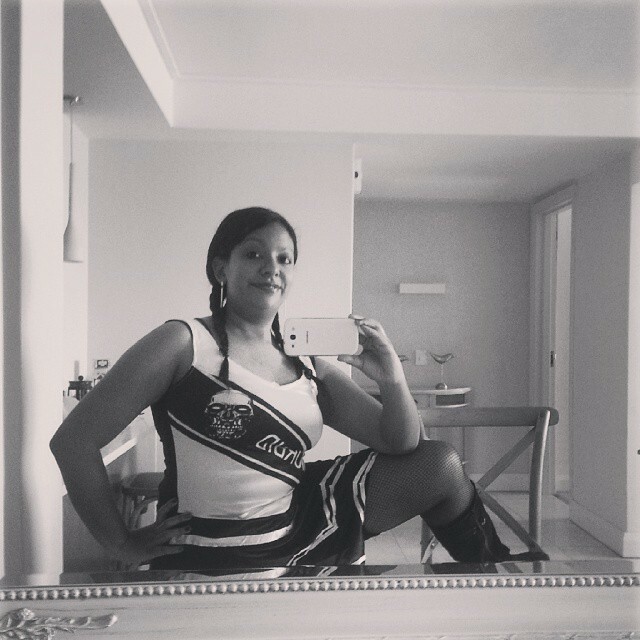 Now, there were tons of getups I could have gone with but if you going to walk with the undead, why not do it as a hot, morbid cheerleader right?! Again, our group of friends gathered to rock our best Thriller moves in the Company’s Garden with make-up expertly done by the awesome Lady K. Who knew being dead could look SO good? I’ve never experienced so many people having so much gory fun before … the creativity of their costumes, their willingness to let their freak flags fly and just the general ghastly spirit were SO amazing! Strangely enough there were quite a few hot stiff ones … guys, I meant, guys! Zombie Walk was also the start of a new level of closeness for House Wyrd … Leilah and MJ would eventually move to London but that day was the start of something awesome, hanging out at insane events and rocking our Wyrdness. As I geared up for Halloween and Zombie Walk 2015 (this time as a bloody hot dead nurse! ), I knew that celebrating the night of the undead would become one of the treasured celebrations for our family in the future … and I hope you’ve enjoyed them all!